Things have been a bit messy with the Microsoft camp. If you're reading this site, you no doubt heard or read about it. A creative director for Microsoft's gaming division spoke out on Twitter, defending the idea of a console that is always online. That means that an Internet connection is always required to use the system's services and features. 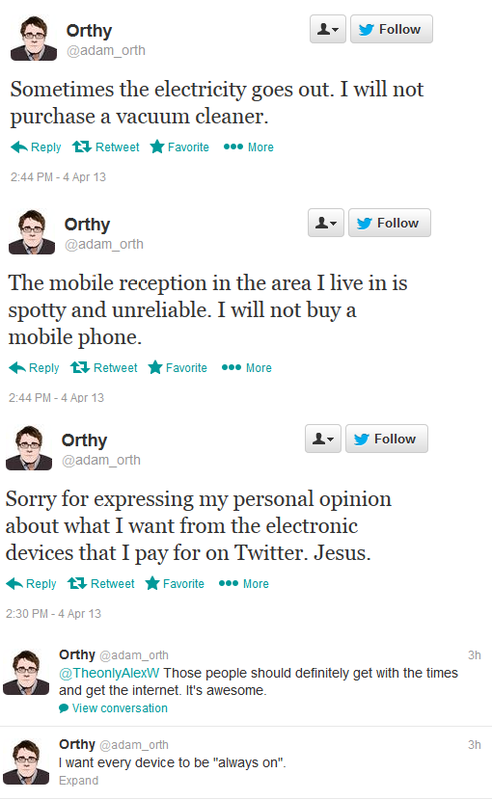 Well, unfortunately, Mr. Adam Orth said his comments in an incredibly rude and disrespectful manner. This not only insulted gamers, but even Xbox fans are up in arms. 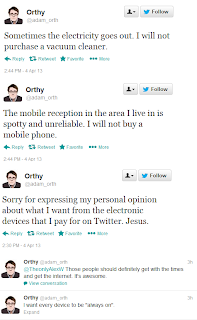 You can see an example of Mr. Orth's tweeting below. Now, we are in the stage of damage control for Microsoft. While an always online next Xbox would be a bad thing to us, it's not the worst thing that we can think of that Microsoft could do with their third console. Here are four troublesome and worrying things Microsoft may have for the so-called "Nextbox." One of the biggest issues we at SuperPhillip Central have with the rumors of the Microsoft's third home gaming console is the idea that it would block used games. Now, (and this will be now written as the author's opinion) I don't know about you guys, but I love being able to try out a game, and if I don't like it, sell it back or trade it in to get some kind of reimbursement back. Or if a game is sitting on the shelf, collecting dust, I can eventually unload it on a gaming trading site and try out a new title. If the next Xbox truly puts the kibosh on the ability to play used games, I will be up in arms. I will not be able to "deal with it." That's not even the end of my beefs with Microsoft's next Xbox either. Let's talk about their extensive lineup of compelling first-party exclusives, or lack thereof. Between Halo and Forza, that's pretty much all that excites some people, myself included, with Microsoft's first-party offerings. 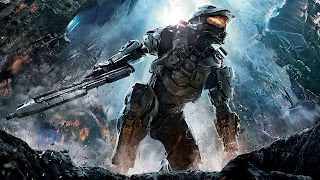 No doubt you purchase an Xbox to play Halo and the plethora of first-person shooters that have gotten more numerous and less original that litter the system's library. I love a good FPS as much as the next guy, but there is always something known as too much of a good thing. I'd love to see Microsoft diversify their first-party offerings with their third console. Let Rare create some colorful titles that hark back to their Nintendo days. Obviously they won't be the same, as most of the Rare staff from the Golden Age of the company are long gone, but at least it would be different for a change. If you think Nintendo plays it safe with their I.P.s, Microsoft constantly goes back to the same handful of franchises, and it's getting quite tiring. but MS as a first-party needs more interesting I.P.s. how "large" most people's gaming spaces are. SuperPhillip Central's final issue with Microsoft and what we are led to believe with the third Xbox is all about online. No, not the always online, but Microsoft's attitude with Xbox Live. I'm sorry, but having to have a subscription to play online with your friends is total garbage. I don't care if you can party chat with Paris Hilton, it doesn't matter to me. Sony has shown that a free online service works (not as well as XBL, but it still works in general), and that people will subscribe to a bonus service (PlayStation Plus) if the incentives are great enough and worth it. Perhaps my distaste for Xbox Live came heavily when Microsoft essentially became so arrogant that they raised the cost of their service from $50 per year to $60 per year. That's for the privilege of playing with your friends, various chat services, Netflix and YouTube (both free on other platforms), and other features. It's absolute nonsense, and I hope Microsoft reconsiders charging people for online with the next Xbox. Microsoft's next generation console will be their third entry in the dedicated gaming hardware race. I am reminded of the so-called "third console curse." We've seen Nintendo stumble with the N64. 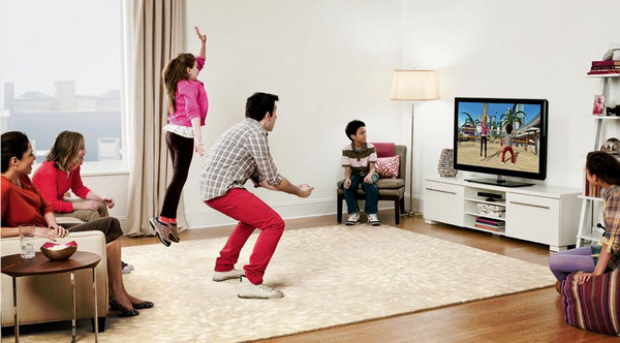 We've seen Sony fall over themselves with the PlayStation 3. Could Microsoft possibly fall victim to the third console curse with this rumored always online console? We have a brand-new list for you to peruse. Yesterday we posted a top ten talking about the Nintendo 3DS's best games from its second year on the market. Let's continue our 3DS theme with another list. A good number of Nintendo DS games have already seen sequels arrive on Nintendo's newest handheld hardware. However, there are still a slew of titles that have been cast to the wayside and have been overlooked for new games on the 3DS. This list is comprised of such titles. From Super Princess Peach to Elite Beat Agents, there are some interesting things that could be done to bring some DS favorites to the 3DS. 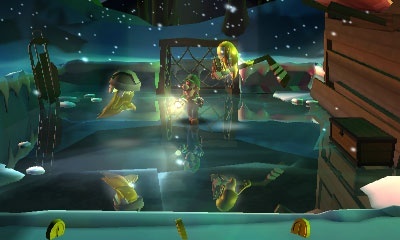 Luigi just got another chance to be the star in his own game, so why limit it to Mario's twin brother? Why not give Mario's main gal another shot at the spotlight with a sequel to the insanely charming (but quite easy) Super Princess Peach? Peach could reunite with Percy for even more parasol action, or how about a new friend to accompany her? 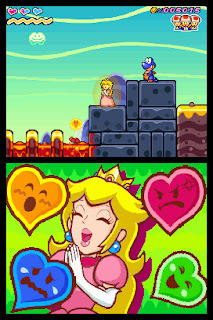 What new emotions could have new powers to aid the princess of the Mushroom Kingdom on her new quest? 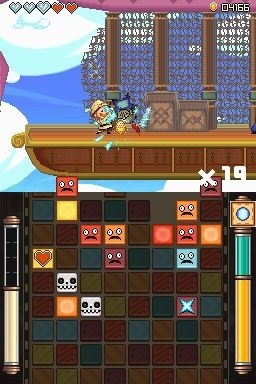 Just the thought of seeing a 2D platformer with parallax scrolling in stereoscopic 3D makes my eyes water. No, those are manly tears. Another platformer from the Nintendo DS was The Legendary Starfy, a game from a series that is not only handheld-centric, but it's also one that was formerly exclusive to Japan. The little starfish that could finally swam all the way across the Pacific for us Westerners to play. 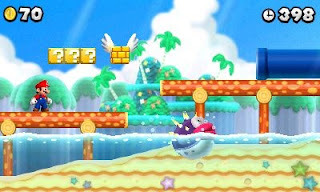 Like Super Princess Peach, The Legendary Starfy was full of platforming peril to show the player's prowess with, and like Peach's first starring game, Starfy possessed a mix of 2D sprites and beautiful backgrounds. The 3D effect on the 3DS would look phenomenal, in my view. Not only that, but we need more Starfy, Nintendo! One game was simply not enough! 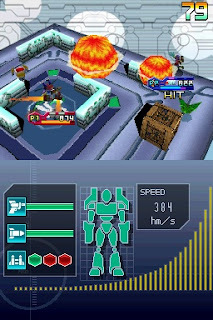 Custom Robo is another Nintendo franchise that has been on a bit of a hiatus recently. 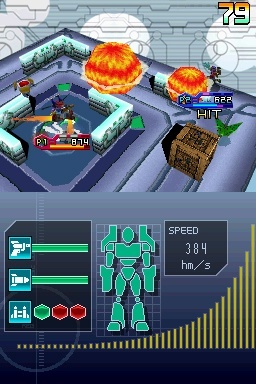 In fact, the last game that released in the series was indeed the Nintendo DS installment, Custom Robo Arena. The premise is simple: you participate in one-on-one battles with your robotic toys in 3D battle arenas. The first person to lose all of their health is deemed the loser. With a 3DS installment, not only could you battle your robos online with other people, but you could trade parts and robos via StreetPass locally and SpotPass online. The possibilities excite me heavily, and it would be another franchise that Nintendo could return to. They have so many of them, after all! 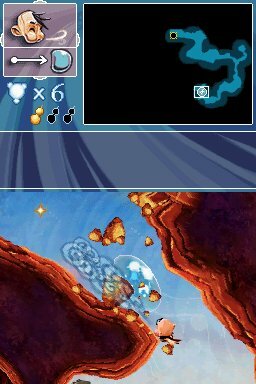 Soul Bubbles is most likely a title you have never heard of. That's okay as it released with little fanfare, but those who did play it found a relaxing and lovely experience. 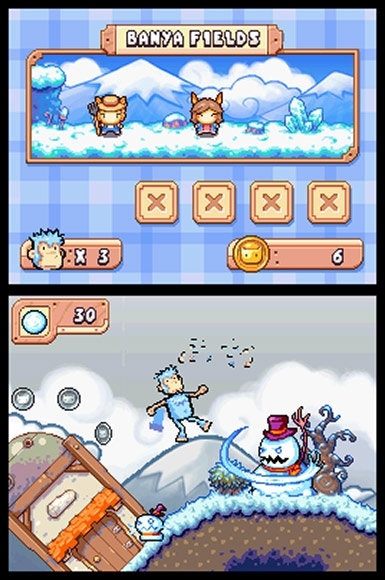 The game had you using the stylus to blow a bubble through numerous levels, filled with increasingly more challenging obstacles, such as spikes, fire, and strong winds. You could learn skills to break up the bubble to enter smaller, narrower passages to collect special items that unlocked new levels and gave you a high score. No doubt Soul Bubbles wouldn't fly in a retail setting. That's just fine, as I dream of the game getting a sequel on digital, downloadable services, like the Nintendo 3DS eShop, for instance. The developers behind Drawn to Life, 5th Cell, just released Scribblenauts Unlimited [basically] worldwide. If you don't know what Drawn to Life is, was a game where you drew what you came in contact with. A missing platform that makes it so you can't cross a gap? Draw a cloud or leaf to serve as the platform. It was a hugely inventive game that gave the player a lot of opportunity for their own creativity. 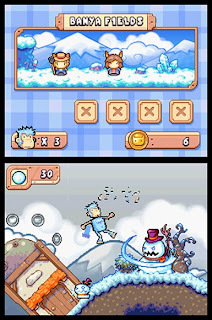 I'd love to see the series return to handheld systems, particularly the 3DS, with the option of sharing drawings, much like you share objects in Scribblenauts Unlimited. I could see myself and many other players losing countless hours coming up with some crazy creations. 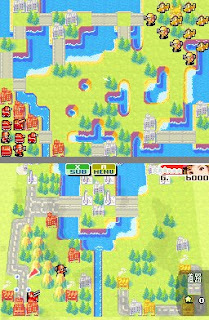 Some may wonder why Advance Wars: Days of Ruin (as it's known in North America) or Dark Conflict (as it's known in PAL regions) is not the game listed here, but instead it's Dual Strike. Dual Strike has a much more lighthearted feel to it, with humor, charm, and color. I'd love to see a 3DS sequel with glorious sprites or even 3D models (as Fire Emblem: Awakening proved that also works) as players assume the roles of one of the many commanding officers the series contains. The idea of sharing custom maps and battling friends and total strangers online excites me totally. Intelligent Systems staff stated they were interested in going back to the Advance Wars series, and off the heels of Paper Mario: Sticker Star and Fire Emblem: Awakening, isn't now the best time to do so? There are not too many loot RPGs on handhelds. 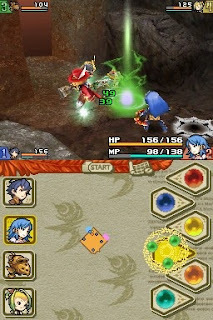 Final Fantasy: Crystal Chronicles: Ring of Fates and then later on Echoes of Time brought tons of loot, action-RPG mayhem, four player cooperative play, savage bosses, and simple puzzles to create one unforgettable handheld experience. The Wii's Crystal Bearers game was a totally different beast than what most fans expected, and while it was good, it was not what a lot of us were looking for. No, we want to gather online to participate in quests, tackle bringing down behemoths and marlboros, and equip ourselves with the best armor and weapons possible. 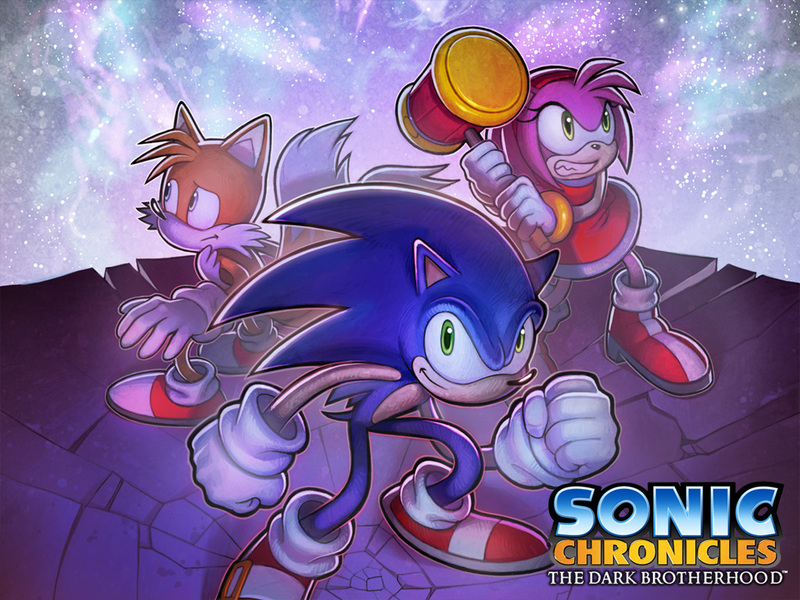 Echoes of Time gave us that, and I wish that a 3DS sequel would do it again. Agents are go. They solve your everyday problems, and they do it while keeping in time with the music being played. Of course, you would get cover versions of the popular songs, but you take what you can get. Elite Beat Agents was based heavily off of Osu! Tatakae! Ouendan, except instead of a Japanese cheering squad, North Americans got a group of funky agents. 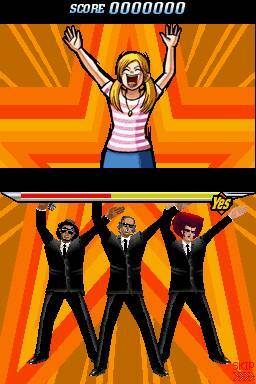 Theatrhythm Final Fantasy had similar but not quite identical gameplay to Elite Beat Agents, and scratched my itch for a rhythm game on the 3DS, but I'd love Nintendo to return to their cheering squad/musically inclined agents for a 3DS-exclusive grand return. Perhaps it's no surprise that The World Ends With You is number one on this list, and perhaps you were very much expecting it. It's no wonder as it is one of Square Enix's most original games in a decade. 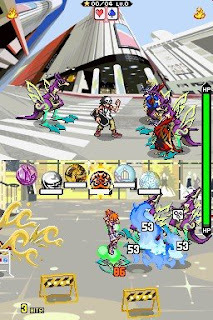 The dual screened battles using unique touch gestures for different attacks, modern world story, and sensational soundtrack made for a game that many players thought about long after they turned off their DS systems. 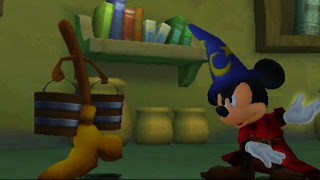 We saw the characters in last year's Kingdom Hearts 3D: Dream Drop Distance, but what about a new game? A 3DS sequel could allow for pin trading via StreetPass and new pins distributed via SpotPass. The more powerful hardware of the 3DS would grant the developers more room for better visuals, sound, and more content. It is a lot of people's wishes (mine included) that Square Enix delivers a fresh and fun sequel. On March 27, the Nintendo 3DS celebrated its second anniversary in the North American market. We've had lots of great times with Nintendo's stereoscopic wonder, and the great times seem to be coming much more often now. Remember that launch? Yeesh. Things have really turned around with the combination of a well-timed price cut and an influx of stellar software. Like we did last year, we're naming the ten best Nintendo 3DS retail releases of the last year. Will your favorites be included or left out? Regardless of the outcome, we're sure we've got some 'splaining to do! We start off the countdown with a game that disappointed longtime Paper Mario fans. The exclusion of partners was killer, and so was the lack of new characters. Heck, even the puzzle solutions were uncharacteristically obtuse for a Mario RPG. So what went right with this game then? Well, the experiment of using stickers for battle, collecting new ones, and keeping enough coins to purchase others was one that worked in our opinion. 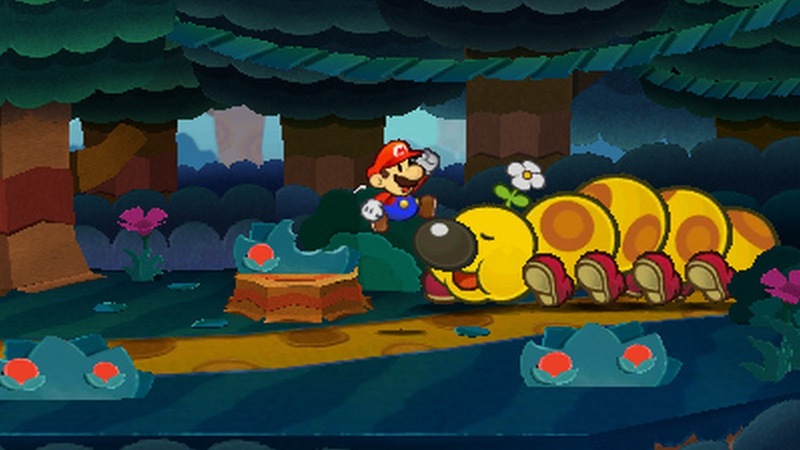 The music is also the best we've heard yet in a Paper Mario game. And even with all of the issues (and there ARE issues) with the game, Paper Mario: Sticker Star was still an enjoyable experience. Welcome to Echo Valley, population: dwindling. With a tale no doubt inspired by the real world, the denizens left in the desolate town lost nearly all they had to their names thanks to a rotten economy. Thanks to your loving parents (or maybe not so much since they're making you do lots of back-breaking labor in running a farm) have left you a farm to build and grow. Along the way you'll find materials and building blueprints to slowly build a thriving new community-- better than ever before! 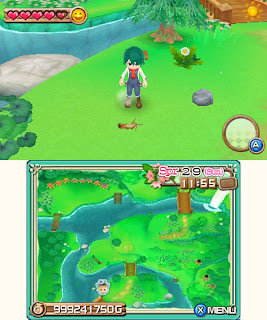 Harvest Moon 3D: A New Beginning is the best Harvest Moon entry in a long while, and playing is indeed believing. Who knew life on the farm could be so much fun? This was decidedly a game that we did not expect to love so freaking much. It's Style Savvy: Trendsetters, a game about storming the fashion world, slowly building your fashion empire from humble beginnings. Yes, you start as an apprentice for a local fashion celebrity, and soon you gain control of your own shop. As you satisfy the needs of your customers, you gain new clothing brands, styles, and areas that you can visit in town. Then there are all the fashion contests you can try to dominate. With thousands of clothing items and loads of content, Style Savvy: Trendsetters isn't for everyone obviously, but for those that give the game a chance, they will find that is really rewarding and entertaining. A Final Fantasy rhythm game where Square Enix can charge you for DLC tracks? And since the music is so phenomenal you WILL want to buy and download new tracks! Why didn't they think of this game sooner!? 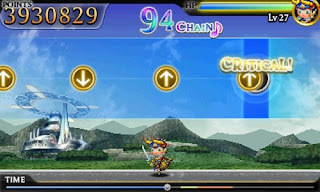 Theatrhythm Final Fantasy originally released on the Nintendo 3DS before a smaller, less complete version went on iOS devices. It has you tapping, sliding, and touching the bottom screen in time with the musical prompts. 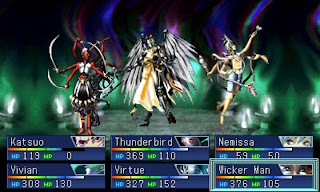 Level up your armada of Final Fantasy all-stars and let them gain new helpful abilities. 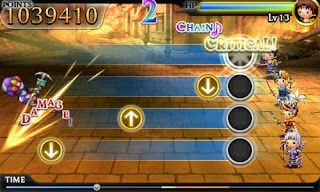 A rhythm game like no other, Theatrhythm is one of SuperPhillip Central's favorite rhythm games period. 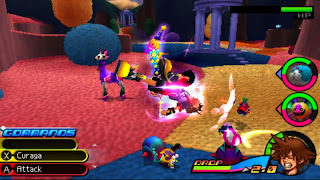 Despite the inane plots and elements of Kingdom Hearts (sure, Nomura, I totally understand why the game is called Dream Drop Distance), you will find an abundance of exciting action with Kingdom Hearts 3D, the prelude to hopefully and finally a Kingdom Hearts III. The game features a new combat system called Flowmotion, which has Sora and Riku slinging around poles, bouncing off walls, and spinning around foes to help assist with defeating the Dream Eater menace. It makes for combat that is some of the most exciting the series has yet seen. With multiple difficulties, awesome Disney cameos, sensational Yoko Shimomura-composed music, and the aforementioned amazing action, Kingdom Hearts 3D is an essential purchase for any RPG fan and Nintendo 3DS owner. Professor Layton has a love and hate relationship with the two of us at SuperPhillip Central. 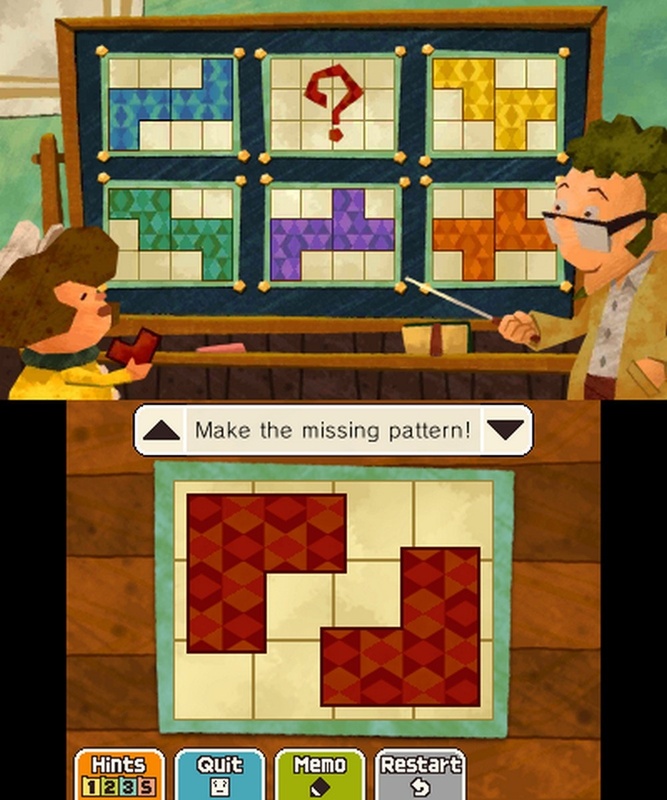 We love the quirky charm and characters, the stories, the presentation, and all those puzzles, but at the same token we hate it when we overlook such a simple solution to a seemingly difficult puzzle. (We also hate those sliding block puzzles.) That "aha" moment is something we don't get too often in games nowadays, and Professor Layton and the Miracle Mask is chock full of them. The game looked into Professor Hershel Layton's past this time, and it made for a story that was intriguing and touching too. If you're a lover of Layton like SuperPhillip Central, then you no doubt already have this game. And if you don't, what are you waiting for? The behemoth-sized encounters that make the Monster Hunter experience so cherished in Japan has finally released in North America with Monster Hunter 3 Ultimate. The added benefits of centering the camera on your intended target and accessible touch screen controls make for one of the better portable Monster Hunters on the market. 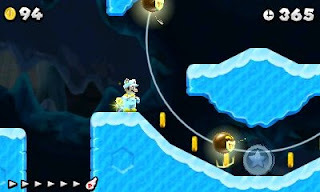 The game is also available on Nintendo's Wii U. 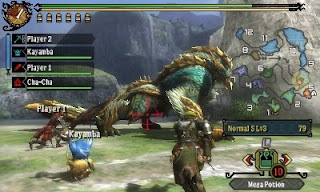 If you own both copies of the game, you can transfer your monster hunting character to and from both versions of the game. Really cool, but Sony did it first! (Har-har.) 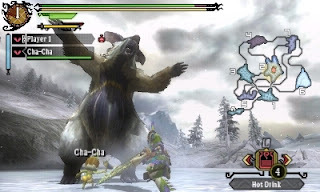 Whether you're a fan of taking the game on the road with you or if you prefer to play at home, Monster Hunter 3 Ultimate has the types of colossal confrontations that will have you clamoring for more, playing until all hours of the night. The Year of Luigi starts out right with Mario's cowardly but cute twin brother once again entering the ghost-busting business in an effort to rid the ghosts from multiple mansions and restore the pieces of the Dark Moon. 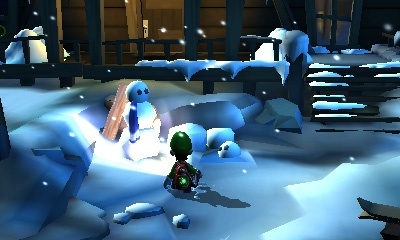 This 3DS sequel to Luigi's Mansion offers a new mission-based structure, incredibly well thought out boss battles, clever puzzle design, multiple cleverly hidden secrets, and gorgeous visuals. Next Level Games really has really improved under Nintendo's guidance, and this is coming from the studio that developed and designed Captain America: Super Soldier! Luigi's Mansion: Dark Moon is a humorous and charming game that was well worth the wait for patient Nintendo 3DS owners. Although rampant shipping issues marred this otherwise impressive debut for Fire Emblem on the 3DS in North America, we managed to track down a copy of the game and enjoy it. 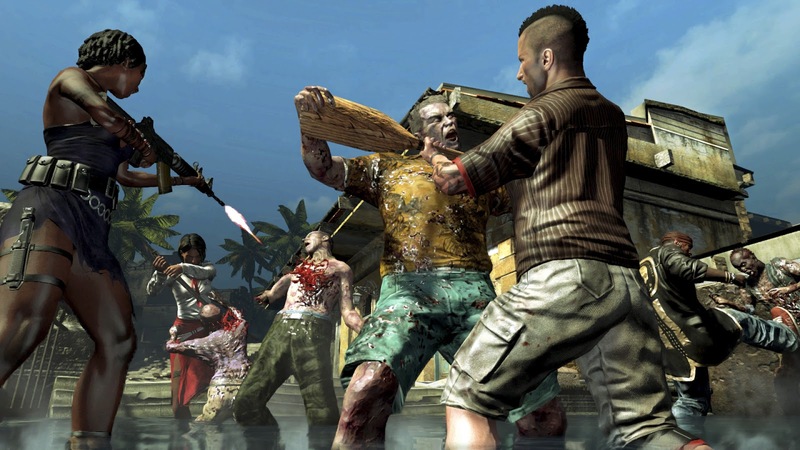 The game featured both the classic mode, where perished characters are gone for good, ones that you have built an emotional investment and attachment to, and a beginner-friendly casual mode, where downed characters return after the battle. 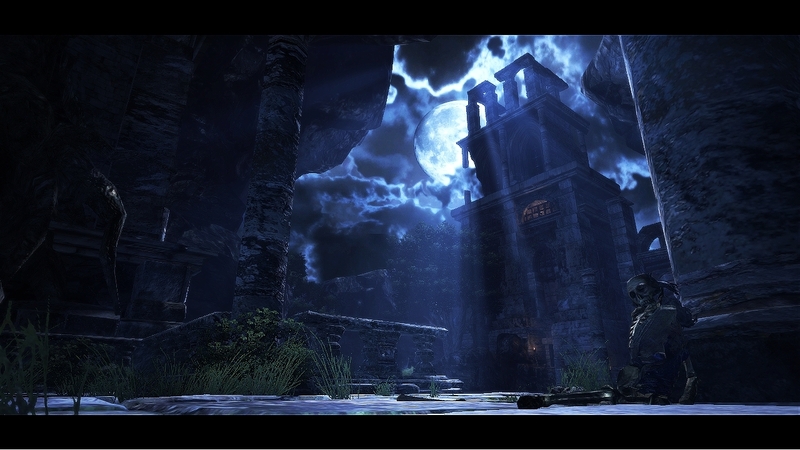 The presentation values are grand with animated cutscenes, an orchestrated soundtrack, and a story that spans three unique acts. 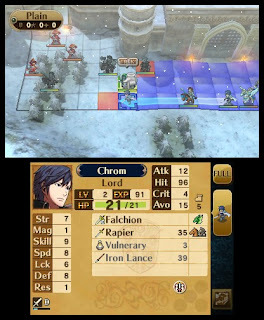 Fire Emblem: Awakening is a stellar entry in the strategic RPG series. Soulless. Tired. Rehash. These are some of the words that critics describe New Super Mario Bros. 2 as. However, we at SuperPhillip Central think of the game differently. We see levels that consistently bring something new to the table. We see secrets that are expertly hidden. Most importantly, however, we see a bright future for the Mario franchise. 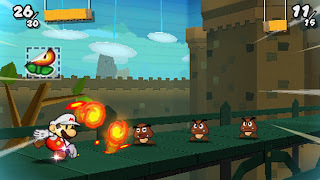 The game was made by a new, less experienced team that went through a crash course of 2D Mario level design. The end result is our favorite game from the past year on the 3DS. Hey, you can't fault us-- we're platform game whores! That's our list of the top ten Nintendo 3DS retail games of the system's second year, but we're curious as to which games would make your list of top retail games. Do you agree or disagree with our order? What games would you remove? Which would you add? We left out Mario Tennis Open and Etrian Odyssey IV, for starters. Let us know your thoughts below in the comments section. As for this year, it's already looking fantastic with Animal Crossing: New Leaf and Pokemon X/Y already announced. It's a good time to be a Nintendo 3DS owner. April has arrived, and spring is in full bloom. This month has seven games that SuperPhillip Central has its collective eye on, and ones that we recommend you look into. 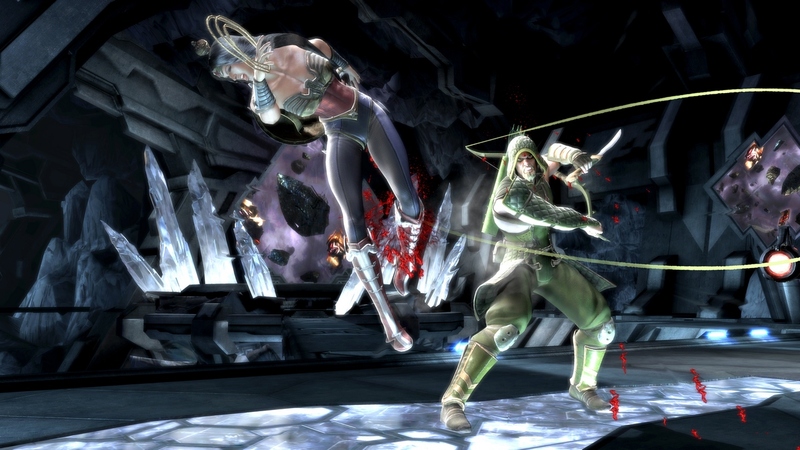 From DC Comics brawlers to a game inspired by Monster Hunter, these titles seem to be the best that April has to offer. Note: 1) These release dates posted are for North American use, and 2) These release dates are what was planned at the time of this article. Games can always be delayed. 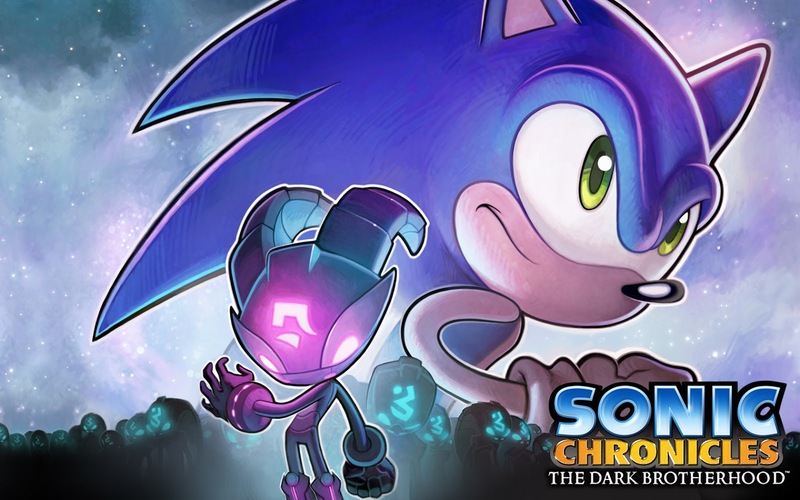 Releasing today is a game that was thought to be a Wii U exclusive. However, Nintendo only distributed the game rather than assisting in the development like they did with LEGO City Undercover. 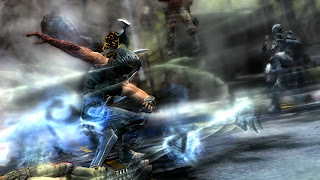 Ninja Gaiden 3: Razor's Edge is essentially Team Ninja's "redo of" or "another shot at" the original Ninja Gaiden 3. This time around extremities can be cut off, more weapons, new downloadable characters like Ayane, and a new Chapter Challenge mode to increase the replay value of the game. It's great that more people get to play this improved version of Ninja Gaiden 3, and they can do it starting today. 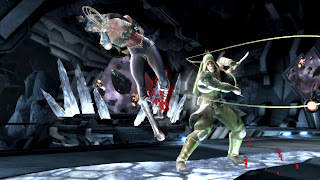 Take your favorite DC Comics superheroes and villains and put them into a 2D fighter with 3D graphics, and you get Injustice: Gods Among Us, a game coming to Wii U, PlayStation 3, and Xbox 360 in the middle of the month. Each fighter has their own unique traits to help them out in battle, arenas are multi-tiered, and the story mode will feature multiple chapters and characters the player assumes the roles of. No doubt comic book fans are looking forward to making some interesting match-ups, and even those with little knowledge of the DC universe will find something to enjoy with Injustice: Gods Among Us. Handhelds this generation have not really had the influx of RPGs that their predecessors had. 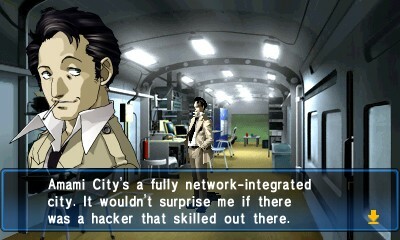 The situation is better in Japan, but the localized RPGs from there that come to the West are few and far in-between. This month the Nintendo 3DS gets the incredibly wordy Shin Megami Tensei: Devil Summoner - Soul Hackers, a first-person dungeon crawler RPG set in a world that is a mixture of cyberpunk and something out of an Edgar Allen Poe poem. There's no word on when this game is coming to our European pals, but North American gamers can add a new RPG to their collection on April 16. 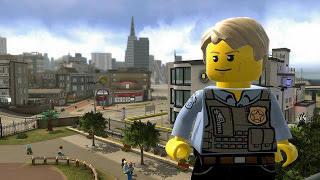 The prequel to the Wii U's phenomenal LEGO City Undercover, the 3DS game, LEGO City Undercover: The Chase Begins looks into protagonist Chase McCain's entry into the LEGO City police force. 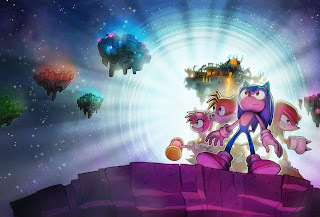 Contrary to what was believed when the game was originally announced, The Chase Begins will in fact be open-world, with obvious graphical downgrades when compared to its Wii U big brother. 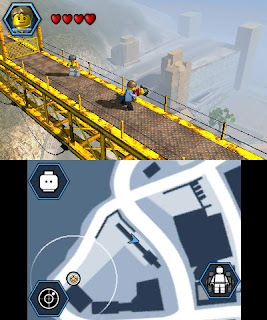 We at SuperPhillip Central very much enjoyed the original LEGO City, so we have our eyes on The Chase Begins when it releases April 21. Zombies seem to never get tiring to some people. We've seen multiple Resident Evil games and now The Walking Dead on AMC is as popular as ever. 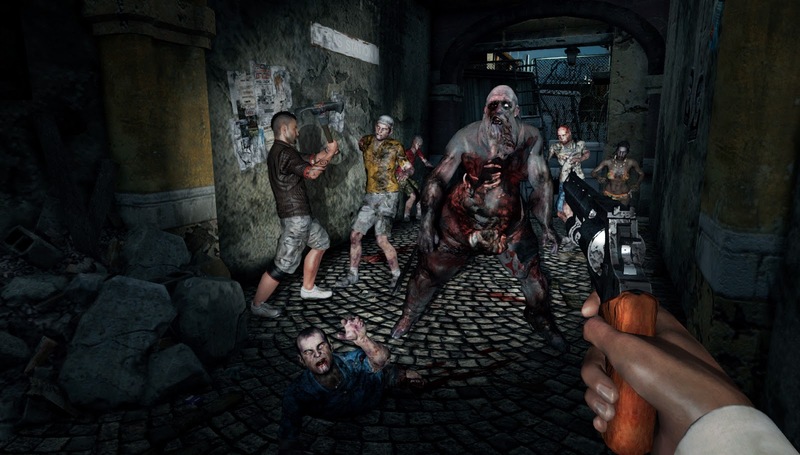 It only makes sense to make more games with the undead brethren that people just cannot seem to get enough of. With a story that picks up where the original Dead Island left off, action RPG mayhem combined with the survival horror genre, and an island infested with zombies, Dead Island: Riptide will place players not in a tropical paradise, but in a tropical hell, two words that most don't put together. These attributes make for a game that intrigues SuperPhillip Central staff, and will no doubt intrigue consumers when it releases late this month. 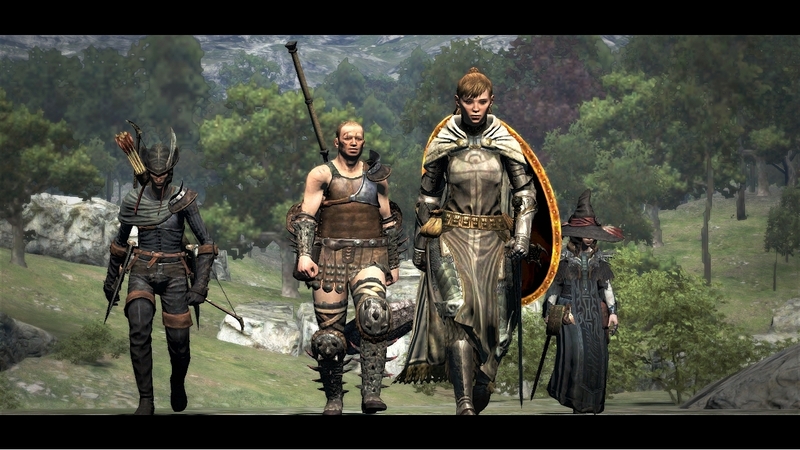 If you didn't get enough of Capcom's Dragon's Dogma that released last year, then prepare your swords, bows, and other weapons for Dragon's Dogma: Dark Arisen, a retail release expansion of the original game. This action RPG title features an open world setting with gameplay similar to what you'd expect a cross between Monster Hunter and Dark Souls would be. The game has a slew of Capcom development all-stars on board, including folks who worked on games like Resident Evil 4, the original Devil May Cry trilogy, and Breath of Fire. If you missed playing the original, I can think of no better way to get introduced to the world of Dragon's Dogma than with Dark Arisen. I mentioned Monster Hunter in my Dragon's Dogma: Dark Arisen blurb. Well, here is a game that is without question inspired by Capcom's hot-selling series. 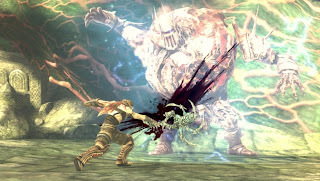 The man who co-created Mega Man, Keiji Inafune, is also the brains behind this upcoming PlayStation Vita exclusive, Soul Sacrifice. 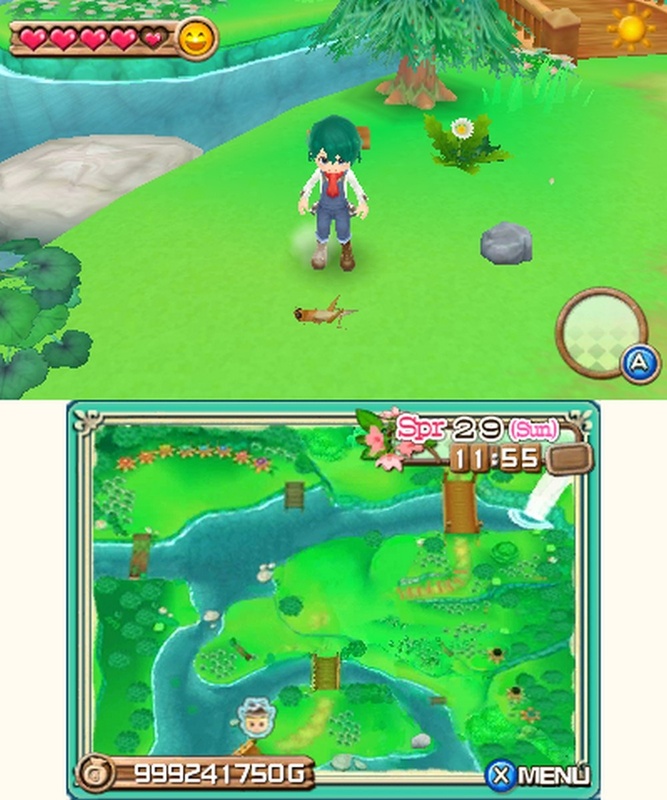 The game already released in Japan to increased weekly Vita sales. Here's hoping the West gives the system a similar treatment. 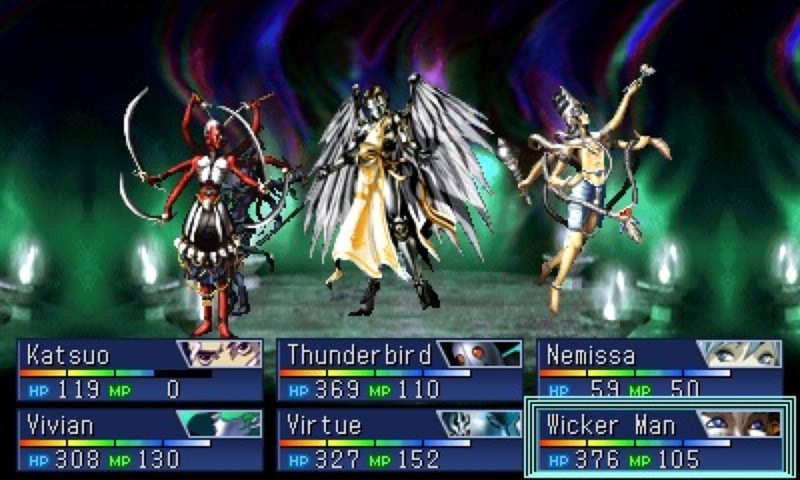 The four player co-op, massive amount of... well... massive monsters, and wide variety of attacks make for a game that might just be a killer app for the handheld that is struggling to find footing in the marketplace. Soul Sacrifice releases at the end of this month. Also worth note this month is the release of Pandora's Tower, which we mistakenly put in last month's offering of titles to look out for. You can see the blurb written for the game here. Are there any games that you are looking forward to this month that we left out? Let us know in the comments section. Chase McCain stars in the best Wii U game yet. Another month of 2013 has been cast to the wayside as we look ahead to a new one. However, before we say goodbye to March 2013 totally here at SPC, let's go over what games were reviewed this past month. We first had our ups and down with Coaster Creator 3D, which won itself the 8.0 prize. Then we followed it up with one of the first reviews period for The Amazing Spider-Man: Ultimate Edition, a game that web-swinged itself to a 7.5. Then we took to the road, water, and sky with our review of Sonic & All-Stars Racing Transformed, a game that deserved its 8.25 score. 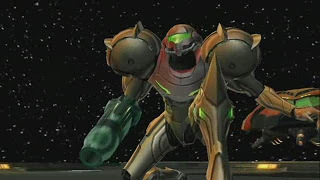 Next we celebrated our 400th review with Metroid Prime, a game heralded by the gaming community for a reason. We gave it a 9.75, the highest score this month. Sackboy and friends raced to a 7.5 with our review of LittleBigPlanet Karting, and finally, the best reason to own a Wii U, LEGO City Undercover, was given an impressive 9.25. It was a great month of reviews. Let's hope April is just as good to SPC as March was! masterful Metroid Prime by Retro Studios. It may be April Fools, but there is no fooling around when it comes to SuperPhillip Central's Central City Census. Let's take a look at the results from March before we go ahead with April's poll. Which announced PlayStation 4 game has you most interested? I am a bit surprised at the results since there seems to be so much anticipation and hype for the PlayStation 4. Regardless, the "None of them interested me." camp is the one with nearly half the total vote. While I was surprised at that, there's really no surprise that Killzone: Shadow Fall is listed as the top game those who voted anticipate most. Then Knack followed close behind as did Infamous: Second Son. I have to admit that outside of maybe Killzone and Infamous, nothing really excited me about the PS4. Sure, the social features are nice, but without games to compel a person, they're just extra features. Regardless, thanks to everyone who voted this past month. Now, onto April's question. Although the digital space is growing and virtual purchases and games are rising in popularity, retail is still a significant part of the consumer and video game industry equation. With physical copies of games, you're able to resell or trade them back in if you're through with them and have no intention of keeping them. 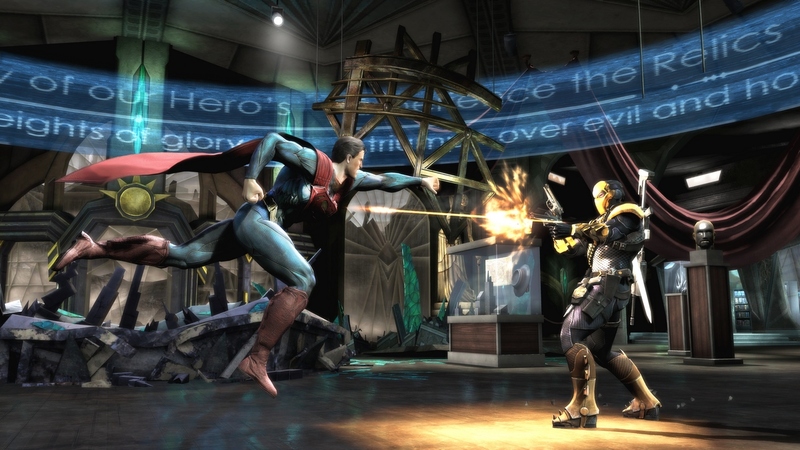 April's Central City Census asks how often you trade in your games. Video game music is something that has transcended just being "background music" or "ambient noise." No, it's gotten progressively greater with songs using real instruments, orchestras, and choirs. Don't get us wrong, we love the old chiptune music as well, and the limitations did not hamper terrific compositions. Today's edition of SPC's Favorite VGMs is a special one. We'll be taking a glimpse at a game with a grand soundtrack. 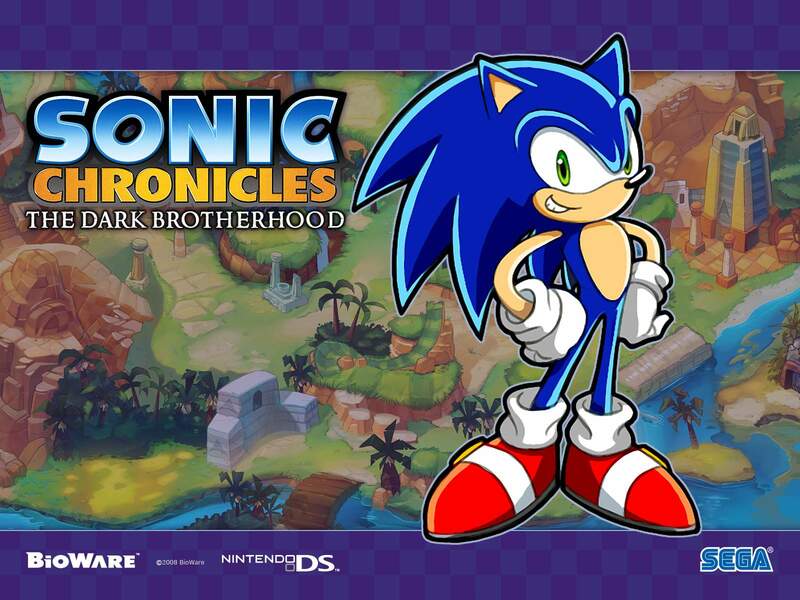 It's one of our personal favorites from the Nintendo DS: Sonic Chronicles: The Dark Brotherhood. We have five (count 'em-- five) tracks that will get your toes a-tappin'. Ah... Central City. That name sounds familiar to SuperPhillip at least. Anyhow, this catchy remix of Sonic 3D Blast's (the Genesis version) Diamond Dust Zone gets the body brewing happiness all over. 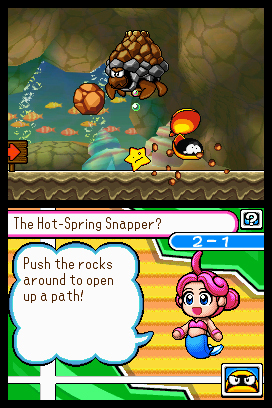 The instrumentation is quite good for the Nintendo DS, a system barely more powerful than a Game Boy Advance. Man, the memories of Sonic the Hedgehog 3 are just flooding back to us. If you are looking for an especially tense and intense tune, then Nocturne (unofficial name) is the track you are definitely, most certainly looking for. Now, these track names are purely unofficial. No legitimate titles were ever given to them. When you have a sensational battle theme such as this one, you don't really need to pleasantries of having a name attached, do you? Maybe you do, so we're going to call this track "Epic Awesomeness." 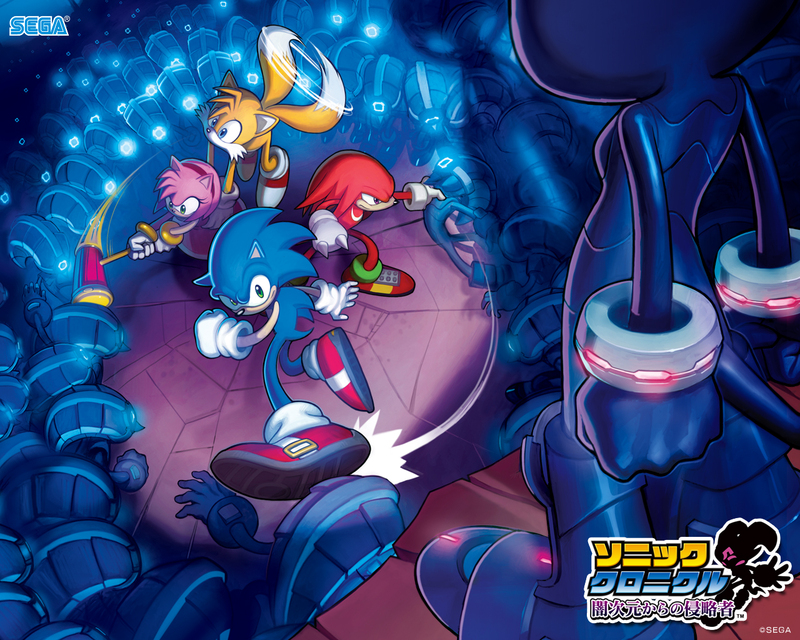 Oh, we have another battle theme to share with you, but this time it's for some of the big bad boss encounters Sonic and his team of brigands enter into. This track also comes from Sonic 3D Blast, but this time it's the PC/Saturn version of Panic Puppet Zone. Battles in Sonic Chronicles: The Dark Brotherhood took quite a while to complete. That is one of the sore spots of this game. The music, on the other hand, never fails to amuse and impress. 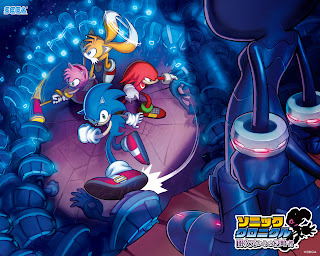 This final boss theme has Sonic and the gang tackling the cybernetic creature Ix. It feels like we're in the midst of a radical rave! We hope you enjoyed this look at the music of Sonic Chronicles. The majestic quality of the soundtrack is one that resonates as a top-tier score, especially for a Sonic game. Next week we'll be back with even more terrific tune-age. Until then, why not check out our VGM Database for every past song spotlighted? Oh, and while we're on the subject... April Fools! Seriously, the music you just heard is god awful. We could hardly type what we did with a straight face.